Our winner of 50 BOOKER PRIZE winners was Katherine Hicks. Like Abbey's, the Booker Prize also turned 50 this year, so as part of our 50th birthday celebrations, Abbey's is giving you the chance to win a treasure of fine fiction for your own personal library. 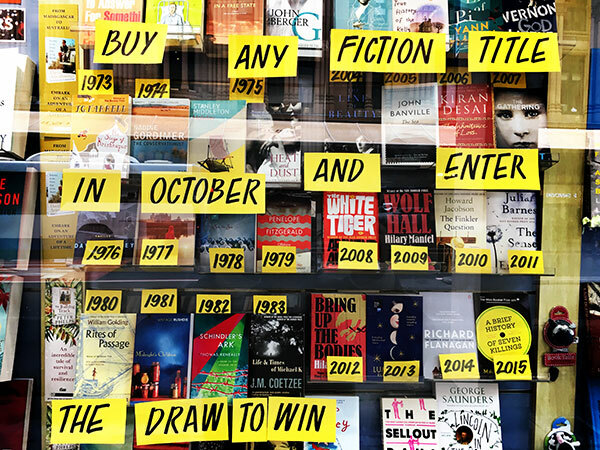 During October, buy any Fiction title at Abbey's and you can enter our Golden Booker competition to win all of the past 50 years of Booker Prize winners – valued at over $1,100! Enter in-store or online. In-store: fill out the entry form after you've made your purchase and pop your entry in the golden box. Online: enter promo code GOLDEN (in caps) with your purchase. We'll draw the winner in early November and notify the winner by email. The winner will also be announced on our website. Awarded in 2010. Due to an administrative decision that shifted the Booker Prize eligible publication dates, books published in the year 1970 were excluded from prize consideration for either the 1970 or the 1971 award. In an attempt to rectify the exclusion, in 2010 twenty-two novels published in 1970 were considered for what was deemed "The Lost Booker Prize." J. G. Farrell's Troubles was determined to be the winner, and the prize was awarded posthumously.